The Web Ahead #115 — recorded LIVE! at An Event Apart Nashville, I joined Rachel Andrew, Jeffrey Zeldman, and host Jen Simmons for an hour-plus look at the present and future of web design and web design technologies, featuring a number of really sharp questions submitted by the audience as we talked. We got Nostradamic with this one, so warm up the claim chowder pots! User Defenders #20 — Sara and I talked with host Jason Ogle for just over an hour about Design for Real Life , digging deep into the themes and our intentions. Jason really brought great questions from having just read the book, and I feel like Sara and I kept our answers focused and compact. The Big Web Show #144 — Jeffrey and I talked for just under an hour about Design for Real Life and the themes of my AEA talk this year. This one’s more of a ramble between two friends and colleagues, so if you prefer conversation a little looser, this one’s for you. 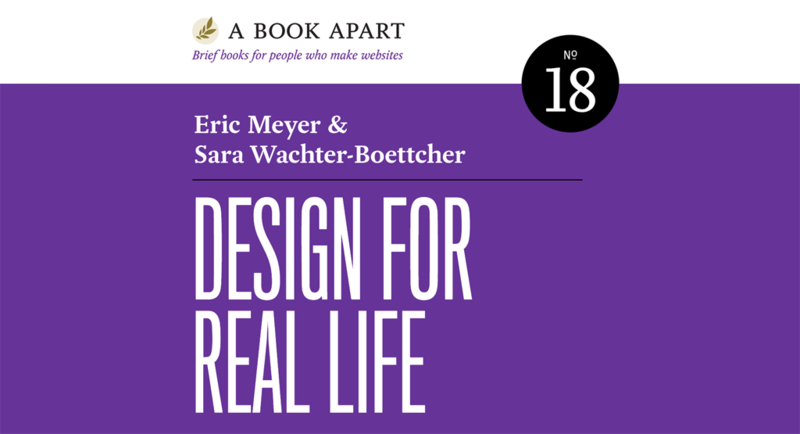 On March 8th, 2016—just eight days from the day I’m writing this— Design for Real Life will be available from A Book Apart. My co-author Sara Wachter-Boettcher and I are really looking forward to getting it into people’s hands. Your post was like a bolt of lightning for me. In the same way the Year in Review thing opened my eyes to what lay beyond “Designing for Crisis”, your post opened my eyes to how far that land beyond reaches. After research and some intense discussions, we started writing in the spring of 2015, and finished before summer was over. Fall of 2015 was devoted to rewrites, revisions, additions, and editing. Winter 2015-2016 was spent in collaborative editorial and production work by the amazing team at A Book Apart. And now…here we are. The book is just a week away from being in people’s hands. To celebrate, Sara and I will be hosting, with incredibly generous support from A Book Apart and PhillyCHI, a launch party at Frankford Hall in Philadelphia. We’ll be providing some munchies, some tasty adult beverages, and there will be giveaways of both paper and digital copies of the book. We’d love to see you there! If you can make it, please do RSVP at that link, so we know how much food to order. We chose Philadelphia as the site for our launch party for a few reasons. For one, Sara lives there, so only one of us had to travel. But to me, it brings some very personal histories full circle, because Philadelphia is where this really all got started. It’s where Rebecca first went to be treated, where she was given the best possible shot at life, and where I started to notice the failures and successes of user experience design when it collided with the stresses of real life. In a number of ways, this book has been a labor of love. The most important, I think, is the love Sara and I have for our field, and how we would love to see it become more humane—really, more human. That’s why we packed the book not just with examples of good and bad design choices, but of how we can do better. The whole second part of the book is about how to take the principles we explore in the first part and put them to work right now—not by throwing out your current process and replacing it with a whole new, but by bringing them into your existing practice. It’s very much about enhancing what you already do. It’s been an intense process, both emotionally and work-wise. We pushed as hard as we could to get this to you as soon as we could. Now the time is almost here. We’re really looking forward to hearing what you think of it. Content blockers have arrived, as I’m sure you’re aware by now. They’re more commonly referred to as ad blockers, but they’re much more than that, really. In fact, they’re a time machine. Sound familiar? It should. We’ve been here before. It’s 1995 all over again. And, just as in 1995, publishers are faced with a landscape where they’re not sure how to make money, or even if they can make money. Content blockers are a two-decade reset button. We’re right back where we were, twenty years ago. Except this: we already know a bunch of stuff that doesn’t work. I don’t mean that ads don’t work. Ads can work. We’ve seen small, independent ad networks like The Deck do pretty okay. They didn’t make anyone a billionaire, but they provided a good audience to advertisers via a low-impact mechanism, and some earnings for those who ran the ads and the network. Ethical? Moral? Rational? Hell if I know or care. Content blockers became the top paid apps within hours of iOS9’s release, and remain so. The market is speaking incredibly loudly. It’s almost impossible not to hear it. The roar is so loud, in fact, it’s difficult to make out what people are actually saying. I have my interpretation of their shouting, but I’m going to keep it to myself. The observation I really want to make is this: the entire industry is being given a do-over here. Not the ad industry; the web industry. Content blockers strip the web back to what it was 20 years ago. All the same challenges and questions are back, full force. How do we make sites better, smarter, and cooler? How do we make money by publishing online? There are reputations and probably fortunes to be made by learning from our many mistakes and finding new, smarter ways to move forward. I would advocate that people start with the core principles of the web standards movement, particularly progressive enhancement, but those are starting points, a foundation—just as they always were. It’s not often that an entire industry gets an almost literal do-over. We have two decades of hindsight to work with now, as we try to figure out how to (re)build a web where users don’t feel like they need content blockers just to be online. This is an incredibly rare and exciting juncture. Let’s not waste it. Facebook is emotionally smarter than we give it credit for, though perhaps not as algorithmically smart as it could be. I’ve been pondering this for a few weeks now, and Zeynep Tufekci’s “Facebook and the Tyranny of the ‘Like’ in a Difficult World” prodded me to consolidate my thoughts. Of course he cannot like it. Nobody can. How could anyone like such an awful video? What happens then to the video? Not much. It will mostly get ignored, because my social network has no way to signal to the algorithm that this is something they care about. What I’ve been thinking of late is that the people in her network can comment as a way to signal their interest, caring, engagement, whatever you want to call it. When “Like” doesn’t fit, comments are all that’s left, and I think that’s appropriate. In a situation like Tufekci describes, or any post that deals with the difficult side of life, comments are exactly what’s called for. Imagine if there were a “Dislike” button. How many would just click it without commenting? 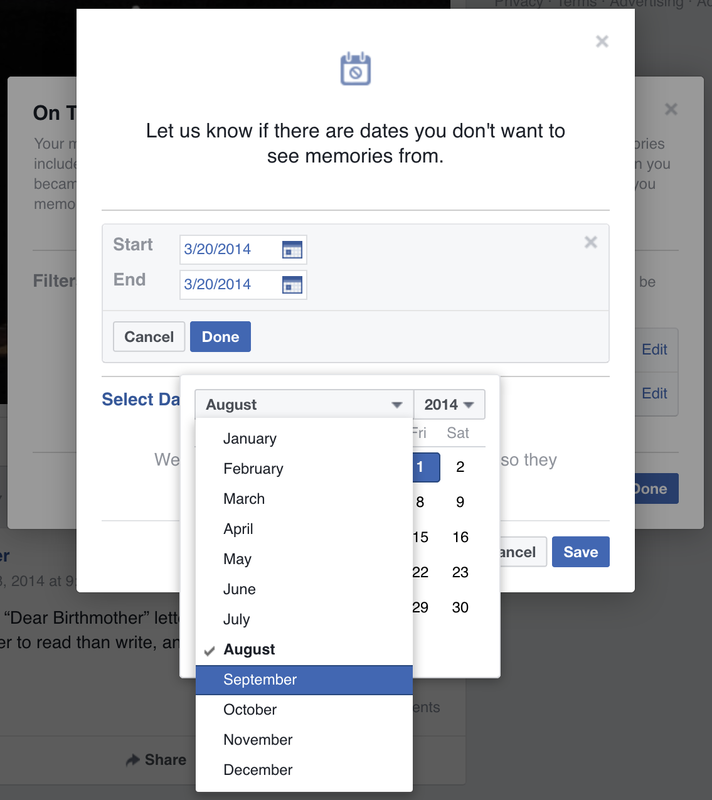 Before you answer that question, consider: how many click “Like” without commenting? How many more would use “Dislike” as a way to avoid dealing with the situation at hand? When someone posts something difficult—about themselves, or someone they care about, or the state of the world—they are most likely seeking the support of their community. They’re asking to be heard. Comments fill that need. In an era of Likes and Faves and Stars and Hearts, a comment (usually) shows at least some measure of thought and consideration. It shows that the poster has been heard. Many of those posts can be hard to respond to. I know, because many of the Facebook posts my wife and I were making two years (and one year) ago right now were doubtless incredibly hard to read. I remember many people leaving comments along the lines of, “I don’t know what to say, but I’m thinking of you all.” And even that probably felt awkward and insufficient to those who left such comments. Crisis and grief and fear in others can make us very uncomfortable. Pushing past that discomfort to say a few words is a huge show of support. It matters. Adding “Dislike” would be a step backward, in terms of emotional intelligence. It could too easily rob people who post about the difficult parts of life of something they clearly seek.